00:10:00 Makes 2 servings, one open-face sandwich (180 g) each. Makes 2 servings, one open-face sandwich (180 g) each. Ripe autumn pears teamed with sliced turkey and cheese make these sandwiches unexpectedly delicious. Served open-face, these Harvest Turkey Melts are anything but ordinary. Mix Miracle Whip and dressing. Spread half of the Miracle Whip mixture evenly onto bread; place, Miracle Whip-sides down, in skillet. 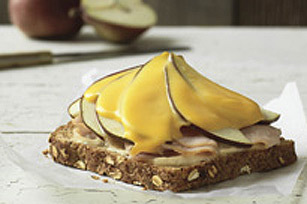 Spread bread with remaining Miracle Whip mixture; top evenly with turkey, pears and cheese. Cover skillet with lid. Cook on medium-low heat 5 min. or until bottoms of sandwiches are golden brown and Singles are melted. Subtitute a small red apple for the pear. Serving Size Makes 2 servings, one open-face sandwich (180 g) each.